(SEPT 29) When Irma “Güerita” Sánchez found out she would be defending her WBF flyweight title she found herself with mixed feelings. The reason: Initially the fight would take place at home in Guadalajara, Jalisco, and that made her a little sad-----but that did not last long as she became excited to know she would fight again in Los Cabos, Baja California Sur. This was the same venue that she fought at where she won the WBC youth World Title in February 2010 against Kanittha Kokietgym. 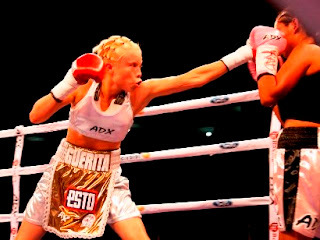 Coming back to Los Cabos motivates Sánchez to give her best effort---making her first defense of the WBF belt against Susana Cruz. Sánchez has been training hard for the last month and she will be closing her preparation to be ready and travel to Los Cabos. “The truth is I was very excited to fight at home again, there were a lot of people preparing to go support me, asking for tickets and whatnot. The promoter knows the reason he does things we as boxers just have to be well trained and do our job”, Sánchez said. “Whatever happens, as the champion I not only represent Guadalajara, but the country of Mexico, and y expect people to respond and support us with the passion I know they have”. When talking about her opponent, Irma declared she isn’t worried at all, as she wants to concentrate on her own work, do things right and the results will come on their own, and she expects her hard work to pay off. “I know there is no easy opponent, every girl has the potential to win, but me as a champion have to demonstrate fortitude and superiority, and I feel pretty good mentally and physically”.